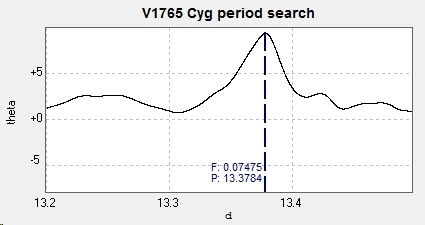 Light curve, period search and phase diagram of the EB type eclipsing binary V1765 Cygni. Photometry from 123 images taken by the Bradford Robotic Telescope Cluster Camera between 2013 July 2 and 2015 December 18. 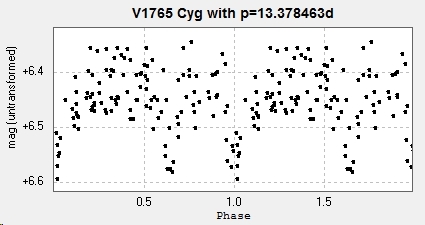 Note the range of the star compared to the scatter of the data points. 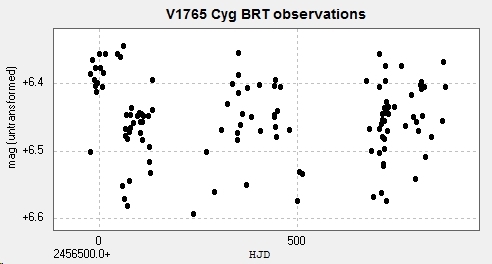 This was always going to be a difficult target for the BRT Cluster Camera with its inherent systematic scatter.